LAS VEGAS, NV--(Marketwire - Sep 13, 2012) - JCM Global is the proven leader in currency validation solutions and created an absolute sensation earlier this year at G2E Asia with its new iV8™ table game bill validator. Now JCM is bringing iV8 to G2E 2012, giving the gaming industry "Intelligent Validation At 8 Notes Per Second." The revolutionary iV8 table game bill validator was developed specifically for the high-volume table game marketplace. 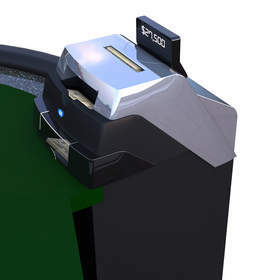 JCM unveiled the first prototype at G2E Asia 2011, and based on extensive in-field research and customer feedback, the unit's overall design has since been modified and compacted to be sleeker, more streamlined, and even easier for the dealer to use and for the customer and operator to increase play time. Currently, the buy-in process on high volume tables like those found in Macau can slow the game dramatically. In fact, the denominating, validating currency process in Baccarat can shut down play for minutes. iV8 counts currency at 8 notes per second, and can instantly and dramatically increase the number of games played per hour. iV8 processes a "brick" of 40 notes in seconds -- from presentation to storage -- in stackable cash boxes. With iV8, buy-ins are inserted directly into an adjoining tray where every note is then validated and counted and the total value displayed for everyone to see and verify -- the player, the dealer, pit management and overhead surveillance, all at an amazing speed of just eight notes per second. iV8 moves rejected or suspected notes into a separate tray during tabulation. This "reject" tray is capable of handling up to 50 notes per buy-in. The entry tray has a capacity of 200 notes, enabling iV8 to process the largest of buy-ins. Because iV8 validates and counts each note, it helps to eliminate human errors and potential fraud in counterfeits, adding to the operation's bottom line. The real ROI is in the number of potential additional games per hour. Now instead of buy-ins completely stopping play for up to three minutes, the iV8 can process a buy-in in just seconds, allowing play to resume much more quickly, and therefore adding the potential for a full hour's play. In addition to iV8, JCM will show its award-winning line of signature products including the iVIZION®, UBA-RC® and Vega-RC® bill validators; the PayCheck 4® thermal printer; the Intelligent Cash Box (ICB®) 3.0; and the Sentry 2.0® smart bezel. Evolve with JCM in G2E booth #3631. JCM Global is the world's leading supplier of innovative automated transactions solutions for the banking, gaming and retail industries. With unsurpassed service and support, JCM Global is trusted by operators, manufacturers and integrators on six continents. Its extensive line of award-winning products set global standards with ground-breaking products like the iVIZION®, Universal Bill Acceptor (UBA®) and Vega-RC® bill validators, Intelligent Cash Box (ICB®) and PayCheck 4® thermal printer. For more information, visit JCM Global's 24-hour tradeshow at www.jcmglobal.com.